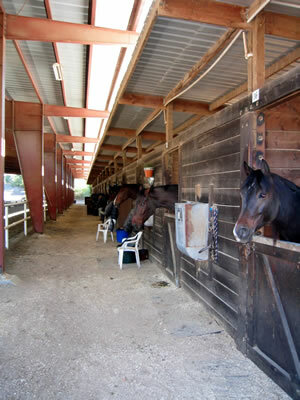 Luxurious 14' x 14' Foaling Stalls adjoin the fully covered Fieldhouse Arena . These spacious, well lighted stalls are lined with deep wood shavings. Wet bedding is removed daily and manure is removed twice daily. Huge Tack Lockers provide access from both inside and outside the stall. Parking is directly adjacent to the barn.